A year has passed since the start of Ukraine's "Revolution of Honour". The student protests organised to force President Viktor Yanukovych and Prime Minister Mykola Azarov to sign an association agreement with the EU developed into a revolution that overthrew the government and sparked a counter-revolution in Ukraine's eastern Donbas region. The revolution, or rather its success, frightened Russia and President Vladimir Putin and he ordered the rollout of a plan to annex Crimea. Nationalist forces inside the Russian Federation, groomed by Russian media for years and flushed with the annexation, took it upon themselves to free the east of Ukraine from the rest of the country. Behind them came Russian military hardware and soldiers, although the Kremlin insists they were not on official army service. This war, officially called an Anti-Terrorism Operation, has continued for some months. From a distance it might seem that the student protests simply pushed over the first in a line of political dominoes, all of which fell in their turn. In fact, the war we have now with Russia has pushed aside the Maidan Revolution, which started in a now dark and sombre past, on 21 November 2013. Few have tried to analyse the progress of those protests and establish what actually happened. But, after a year, it is time to start making sense of what occurred. Did Viktor Yanukovych ever intend to sign the treaty of association with the EU? If he had ever wanted to do that, I feel it was only in order to take revenge on President Putin for not fulfilling his promises, including the promise of lower gas prices. This explains why, having later received $15bn of cheap credit and discounted gas, Mr Yanukovych so casually and quickly rejected the opportunity of a European future for Ukraine. 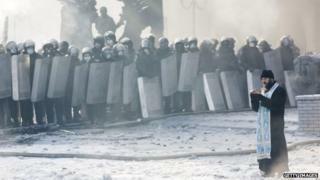 On 29 November, for the first time since Ukrainian independence, the special forces police or "Berkut" used violence against protesters, sparking mass protests which, as it turned out, the president and his entourage could not control. After the disappointment that came with the previous governments of Viktor Yushchenko and Yulia Timoshenko, I often heard people say that the Orange Revolution which the two leaders were part of had not come to anything because victory had been achieved without a real struggle, with no blood and no fatalities. I was often reminded of these words after 21 November. First, when not far from the peaceful protests on Independence Square radically-minded participants began building barricades on Grushevsky Street which leads up to the parliament. A good number of people were fed up with peaceful protest in 2013. Many realised that Viktor Yanukovych would hold on to power to the last, but at the time few considered where this hatred of him came from, a hatred that roused hundreds of thousands of people from their usual state of political apathy and sent them to Kiev's Maidan to stand under the blows of police truncheons and the deadly aim of expert snipers. Today, I am sure that this hatred appeared a long time before the student protests. It took shape back in 2010 when Mr Yanukovych first became president. That was when he decided to take the entire country under his control, replacing the top and middle echelons of state authority with representatives of the Donbas region, sweeping aside the indigenous elite. He had never studied Ukrainian history and probably did not know that, in 1945, exactly the same policy had been practised by the Communist Party of the Soviet Union. In Western Ukraine, the local elite were replaced by "specialists" from other regions and republics of the USSR. That policy gave rise to a guerrilla war that lasted for 15 years. The attempt to colonise the whole of Ukraine with the Donetsk elite set the population of all regions against Yanukovych, at the same time reinforcing in the minds of the population the idea of the Donbas as a territory where criminal methods were casually employed to take control of the entire country - all the business and the flow of financial resources. That is why Ukrainians spent only the first eight days of their protest fighting for the choice of Europe. After that, the mass protests were about a rogue state that featured an incredibly high level of corruption and a lack of respect for human rights. I well understand that, had it not been for the barricades on Grushevsky Street and the radicals from Right Sector and Svoboda who took up arms against the police who were sent to control them, the revolution would not have succeeded. Had the revolution not succeeded, President Putin would not have annexed Crimea, there would be no war in Donbas and Russian nationalists and Russian secret services, together with pro-Russian activists, would not have tried to incite uprisings against Kiev in Odessa and other cities in the south-east. But dominoes only fall one by one. They cannot raise themselves again. Equally, you cannot rewind history. It is unclear how the current chapter of Ukrainian history will end. I remain optimistic in spite of the pain I feel remembering those who died in the battle for a new Ukraine and those who are still dying and risking their lives on the Donbas frontline. I do believe Ukraine will withstand it all and will maintain her independence and that the Ukrainian people will hold on to their desire to live in a civilised state cleared of a corrupt elite and corrupt judiciary. But without the European Union's help, Ukraine will not be able to achieve this. Not because the Ukrainians lack determination, but because beside Ukraine stands a Russia which needs Ukraine to remain as it was under Yanukovych and other presidents - weak, passive and corrupt.